Last week, the head of the Phoenix Viewer team, Jessica Lyon, made an appearance at the Ambrosia Live Second Life talk show. She answered some questions from hostess Ambrosia Kamala, then took questions from the audience. Jessica told Ambrosia that contrary to what some thought, she was no “coder genius” - “the team are the real geniuses. I’m just good with people.” She stressed that everyone at Team Phoenix was a volunteer, whom contributed without pay, including herself. Jessica felt Linden Labs had the viewpoint third-party viewers, Phoenix included, were becoming more of a necessity. She brought up Viewer 2, having the opinion Linden Labs wanted a newcomer-friendly viewer, and about halfway through realized their efforts were leading to something quite different from the old viewer, and older residents would probably be hesitant to adopt it. She reasoned they went ahead, feeling third-party viewers would help “take up the slack” of the old viewer no longer being supported. Someone asked of there would be a Phoenix viewer as an application for handheld devices like iPhones and iPads. Jessica responded that it sounded like a good idea, but their team didn’t have the time to both work on that and it’s computer viewers. Jessica mentioned that the SpotOn 3D Grid, another virtual world much smaller than Second Life, had adopted Phoenix as it’s official viewer. Their dealings with Linden Lab were brought up. She explained that when the Phoenix team was first formed, it was a bit difficult dealing with them because much of the sense of trust had been “destroyed” from the Emeraldgate controversy. Time, however, was allowing it to slowly rebuild. Talking more about Linden Lab’s motivations for encouraging the use of Viewer 2, Jessica felt the Lab has to convince residents to switch to a “2.0 base” before Second Life can truly progress. One example is the Mesh feature that was under development. It was designed to work only with Viewer 2. On Viewer 1, Mesh objects look scrambled. She mentioned one disadvantage Linden Lab has when competing against 3rd-party viewers: expense. They had expensive overheard 3rd party viewer teams didn’t need to get. While Team Phoenix could just have a group chat inworld to discuss updates for the viewer, Linden Labs has to have a roundtable meeting in an office in real life, with developers paid $40 an hour. With Jessica was Ed Merryman, another of the Phoenix Team. He mostly left the speaking to Jessica, though made a few jokes about the word “wiki.” He also mentioned that the source code of Viewer 2 was much cleaner than the old viewer. The old viewer, he commented, had been patched and updated so many times, it had become a tangled mess of codes. Following the show, Jessica talked with a few of the audience, which was a diverse mix of avatars, including a number of ethnic human, furred, and tinies. 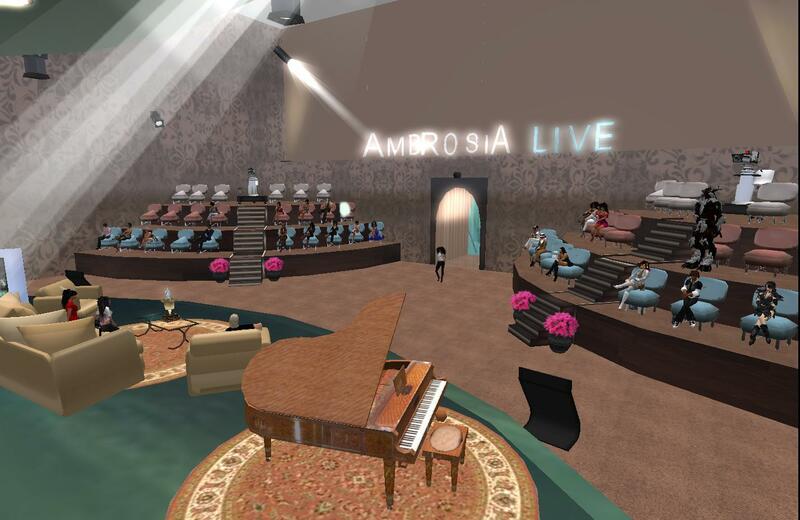 Ambrosia Live takes place on Tuesdays and Thursdays from 5 to 6 PM, located at the aMuse sim (32, 16, 2994). It's a fairly new show that's gotten some attention, including a media award. Did you know that you can shorten your urls with OUO and receive money for every click on your shortened links. ROBLOX is driven by a growing player base of more than 300,000 creator players who generate an infinite variety of highly immersive experiences. These experiences range from 3D games and contests, to interactive adventures where friends can take on new personas imagining what it feels to be a dinosaur, a miner in a quarry or an astronaut on a space exploration.